Horse Guards Arch is the official main entrance to both St James's Palace and Buckingham Palace. 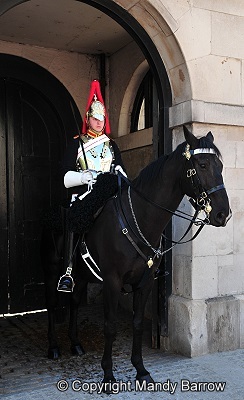 The Queen's Household Cavalry is the mounted guard at the entrance to Horse Guards Arch. 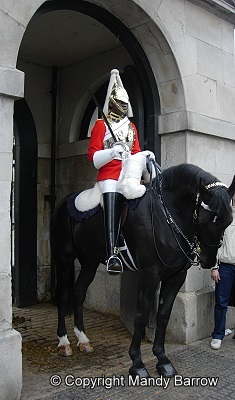 The mounted sentries (who change every hour) are on duty each day from 10am until 4pm, at which time there is a dismounted parade of the Guard. The Life Guards (in red) and the Blues and Royals (in blue) have been guarding the gateway since Tudor times. 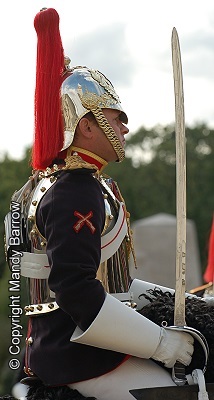 Horse Guards is the best place to get up close to the guards. There are two dismounted sentries on duty until the gates are shut at 8pm, when only one sentry is left on guard until 7am when the second sentry returns on duty. 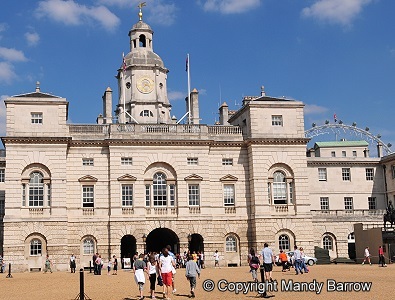 Horse Guards Parade is a large parade ground. It was formerly the site of the Palace of Whitehall's tilt yard, where tournaments were held in the time of Henry VIII, between knights in armour. Today it is the scene of the annual celebrations of the Monarch's official birthday - Trooping of the Colour. 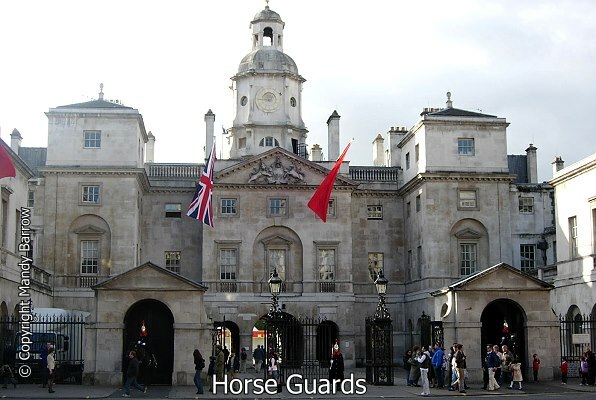 At Horse Guards Arch, Changing of the Guard takes place daily at 11.00 am (10.00 am on Sundays) and lasts about half an hour; it is normally held on Horse Guards Parade by the arch of Horse Guards Building at Whitehall. The guard is formed from the two regiments that comprise the Household Cavalry, they are the LifeGuards, originally the bodyguard to Charles I, and the Blues and Royals, formed from a regiment serving Oliver Cromwell. 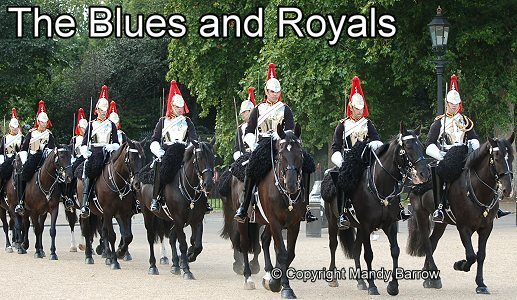 The Blues and Royals wear red plumes and blue uniforms. 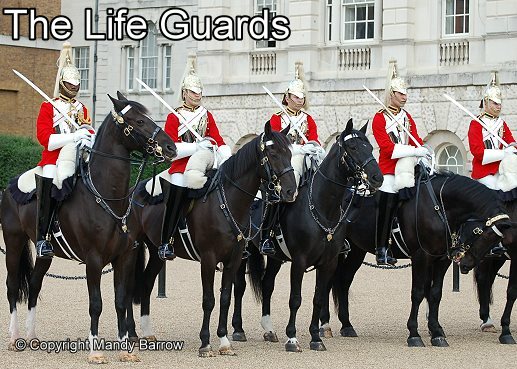 The guards who guard the Queen and the Royal Palaces are all part of the Household Division. Go through the parade ground at the back of Horse Guards. 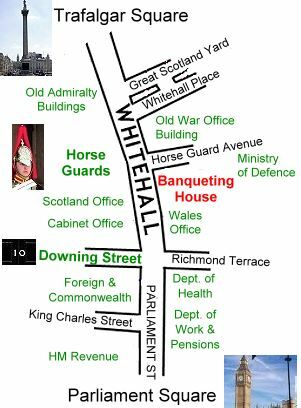 OR continue down Whitehall (see map below). Hover over and click on the labels on the map.